Firehouse Pizza 766-7171 North Smithfield Rhode Island, RI. Pizza, subs, salads and more! 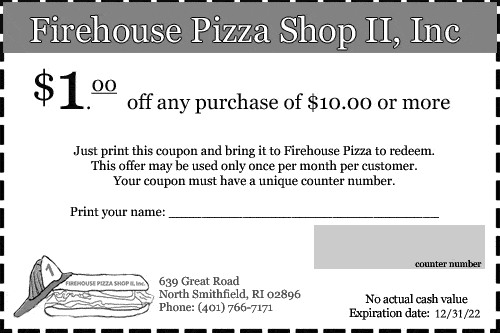 When you bring in your Firehouse Pizza Coupon, be sure to write your name, address and telephone number on the back. You'll be entered in our monthly drawing for a $10 Gift Certificate to Firehouse Pizza. to save with a Firehouse Club Card!